Brand consistency. Better than selfies with bears. But what about the things that actually hurt when they are inconsistent? Brand inconsistency is right up there with things like talking selfies with bears. It works occasionally, but there’s a pretty good chance you will fail hard. OK, maybe you won’t die if you hurt your brand, but your business could die off. Why is this important? Why do you want to keep your figurative business limbs? You want people to take your business seriously. Humans tend to trust things that are aesthetically pleasing and don’t change too drastically. It’s hard to build trust if your branding is all over the place in terms of logos, colors, and quality. In fact, a few of the things people look for in emails to determine if the sender is a real company, is whether or not the branding is consistent, logos sharp, English is good. They also use this method against websites and any print material they encounter. If your marketing material is not sharp and consistent, it’s held in suspicion. 2. 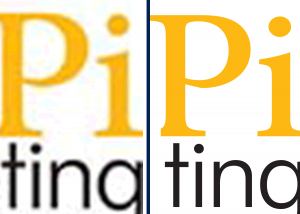 Have a good quality logo. I don’t just mean a logo that is designed well and catches the eye, I mean choose to display the best version of your logo. If all you have are a bunch of jpegs with funny digital “halos” around some of the logo elements, or if you have a fuzzy image, it’s time to ask your designer for a fresh logo file. Make sure you get all available logo formats and file types, so that you can use them for websites or giant posters and not sacrifice quality in the process. 3. Make a list of all the digital and print media places that your brand is displayed, and go through those to correct logos, colors, contact information, descriptions, etc. Verbiage and visuals should be consistently branded, but the details can be tailored to fit the audience you are trying to reach in each place. 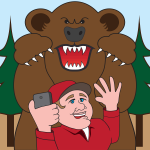 So, next time you see one of your social media pages and think you’ll get around to fixing it up later, just remember that somewhere out there is a guy trying to take a selfie with a bear. He is taking on a monumental task and will probably fail. You have a small task. All you have to do is take a few minutes to successfully make your business better! I bet you will feel more alive than the other guy when you are done.